There are a variety of ways to see all applications or programs which are running on a Mac, ranging from only seeing “windowed” apps running in the graphical front end, to revealing even the most obscure system-level processes and tasks running at the core of Mac OS. We’ll cover five different ways to view these running apps and processes in Mac OS X, some of which are very user friendly and applicable to all users, and some of which are more advanced methods accessible from the command line. Take the time to learn them all, and you can then use the method most appropriate for your needs. The simplest way to see what apps are running at the moment is to just glance at the Mac OS X Dock. If you see a little glowing dot under the application icon, it’s open and running. Though there’s nothing wrong with using this approach, it’s obviously a bit limited since it only shows what are called “windowed” apps – that is, apps that are running in the GUI front end of Mac OS X – and it’s also limited in that you can’t take direct action with them. Additionally, those little glowing indicators are small and not that obvious, and many people don’t notice them at all. Fortunately, there are better ways to see what’s running on a Mac, and also be able to take direct action if there is a need to quit an app or two. Despite the windows name, you can use this to view actively running programs and apps without actually quitting them. One obvious advantage to the Command+Option+ESC menu is that it allows you to actually take action on running apps directly, letting you force quit them if they have become errant or are shown in red font, which signifies they are not responding or are crashing. This simplified version is fairly similar to the basic “Control+ALT+DELETE” manager that exists initially in the modern Windows world. 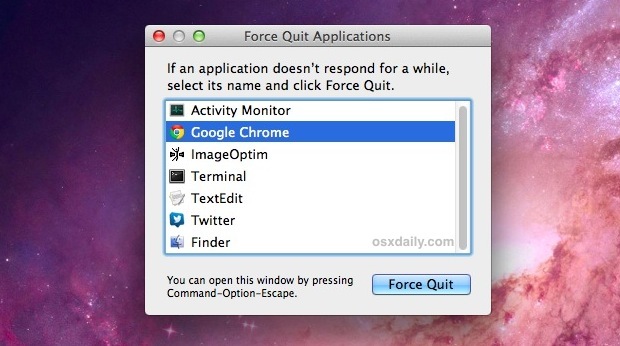 The primary limitation with the Force Quit Menu is that, like the Dock indicators, it is limited to revealing only the “windowed apps” that are actively running in Mac OS X, thus skipping over things like menu bar items and background apps. 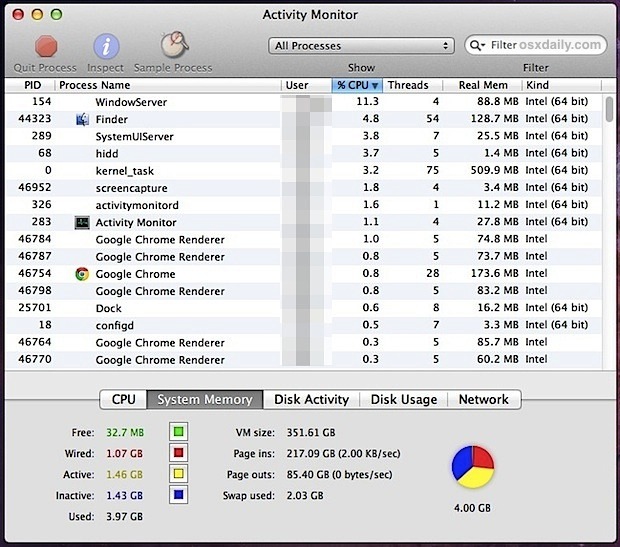 The most powerful app and process management utility in the Mac OS X GUI, Activity Monitor is a powerful task manager that will reveal not only all running and active applications, but also all active and inactive processes. This includes quite literally everything running on the Mac, including the aforementioned windowed apps, and even background applications (those not visible as running in the Dock or the Force Quit menu), menu bar items, system level processes, processes running under different users, inactive processes, service daemons, quite literally anything and everything that is running as a process in Mac OS X at any level. The app itself resides in /Applications/Utilities/, but it’s also easy to launch it through Spotlight by hitting Command+Spacebar and typing “Activity” followed by the Return key. A way to simplify all of the information initially shown in Activity Monitor is to pull down the Process submenu and select according to what you’re looking for, like “All Processes”, “My Processes”, “System Processes”, or “Other User Processes”, among the other options. The “Search” feature is also easy to use and quite powerful, since you can start typing the name of something and it instantly updates according to which processes match the query. Activity Monitor offers a ton of tools and options, and it’s easily the most advanced way to view extended information about all active processes without jumping into the command line. It let’s you quit processes, kill applications (kill is basically the same as force quitting), inspect and sample processes, sort processes by names, PID, user, CPU, threads, memory usage, and kind, filter processes by user and level, and also search through processes by name or character. 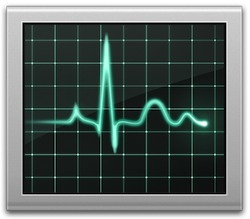 Furthermore, Activity Monitor will also reveal general usage stats about CPU, memory, disk activity, and network activity, making it an essential troubleshooting utility for determining everything from inadequate RAM levels to diagnosing why a Mac could be running slow based on the myriad of other possibilities. As an added bonus, you can also keep Activity Monitor running all the time and turn it’s Dock icon into a live resource usage monitor to see what CPU, RAM, disk activity, or network activity are up to on a Mac. Delving into the command line, you can use a few more advanced tools to view every single process running on the Mac, ranging from basic user-level apps to even the tiny daemons and core system functions that are otherwise hidden from Mac OS X’s general user experience. In many ways, these tools can be thought of as command line versions of Activity Monitor, and we’ll focus on two in particular: top and ps. top is updated live, whereas the next tool ‘ps’ is not. This allows you to view pages of the output at a time without having to scroll up and down in the Terminal window. When looking for apps running in the GUI, it’s usually best to use the same case that the apps use in Mac OS X, or else you may not find anything. These are all great tips, thanks! I also used to love (in Snow Leopard) that I could take 4 fingers to the left or right on the trackpad and get the same thing as Command+tab. Is there a similar trackpad movement on OS Mavericks? I’m into my first week on Mavericks and I miss this feature. Thanks! Thanks for sharing this info.. It helps me..
Apple, biggest pile of social climbing crap for wannabe’s ever made. Great, everyone is glad that you got to check which processes were running in OS X, but nobody needs your weird political and social commentary. You’re 12 years old, that’s wonderful, keep it to yourself. When you are done with your Mac and using Mac apps, be sure to thank your parents for buying it for you. Maybe give it back to them. Could be right but they’re good computers and fun to use. Relax, and don’t let it bother you that a few people like Apple. Enjoy your PCs which are good products and which can do some things better than Apple. I enjoy going back and forth between the two and get both frustrated and delighted by both at different times. Thanks for these clear explications, all except the last were clear for me. I was only in the past using command line activities and batch files in GWBasic and its successors. Thanks, just needed to Force Quit an app that wasn’t closing. How can I check a process is running with grep? I want to execute a bash script and pass a command after an application quits. I am quitting through osascript. Is there a boolean command to check if the application is running? The “pgrep” command is also useful in that it returns the process ID(s) of a matched process. That will report “Running” if a match is found, and “Not running” if no match is found. Thank for the post. I hate it when stuff needlessly starts and runs when I don’t need it to. It just bogs down my memory. This helped a lot. I would love to see this post updated to OSX El Captain. It is definitely annoying to have all those apps popping up when I start my macbook. Hey Nick, this applies to all versions of Mac OS. 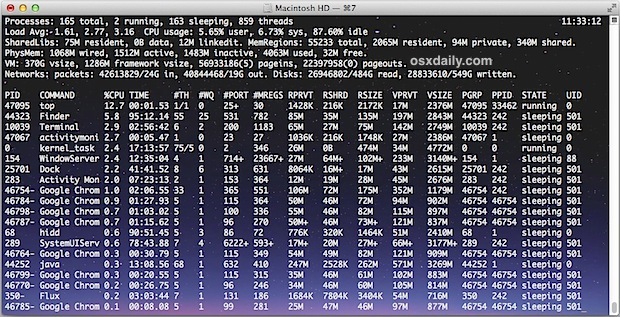 In fact, you can view all running processes and apps this way using any version of Mac OS or Mac OS X, whether that is macOS High Sierra, Sierra, OS X EL Capitan, Yosemite, Mavericks, Snow Leopard, Tiger, Mountain Lion, or any other version, they all include “Activity Monitor” and the various tools to monitor and observe processes this way. This is an excellent article – for which I thank you! I’ve run ‘System Diagnosis’ from the Activity Monitor. Is the resulting Zip file sent automatically to Apple? Thanks, that helped a lot. I like to switch off anything non-essential when I am recording audio. I hate it when the fan comes alive in the middle of recording. Thanks again, invaluable advice.